Followed by a great dinner with friends. Looks like 2 formed together, yet 1 humongous bubble simultaneously! Reblogged this on Il Blog di Tino 2.0 Mah!. Bubbles are laughter that you can see. This is so cool.. I love the pictures you make!! hy where are you come from ?? Reblogged this on From my soul, to yours.. This is a great photo I spotted on one of the blogs I’m following. I just had to pass this along. Reblogged this on Ahmad Syafiq. Reblogged this on Barry Piatoff@WordPress. Something is so innocent and magical about these miniature, iridescent anomalies… What say you? 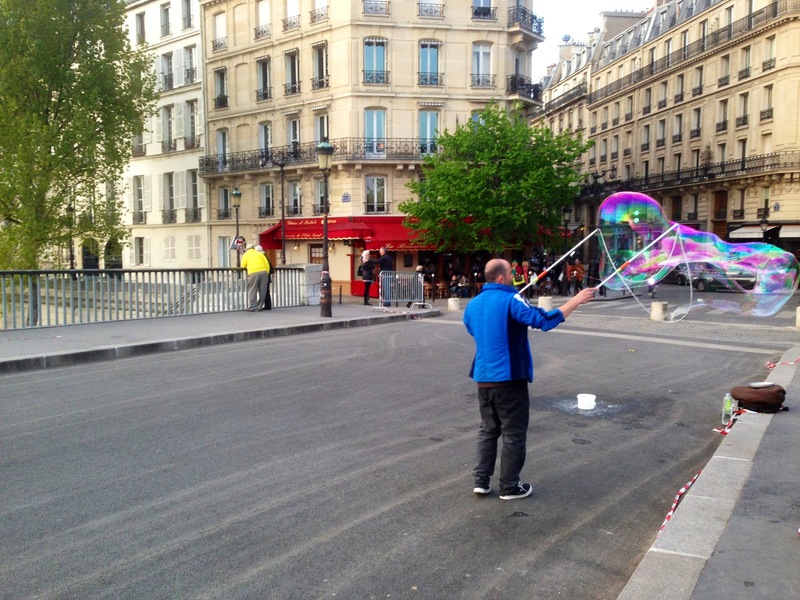 When I have been in Paris I still was a child an I remember that I loved these bubbles. linda paris estuve alli por 5 anos. That is a real craft, great capture! Took the kids to bubblelrama at the Vancouver Science Center a couple of summers back it is a fascinating spectacle! Ha, there’s always something cool going on on that bridge. Great dinner! Was it at the Alsacian brasserie on the corner in the background? I wonder if Bubbles (the tap dancer) ever was in Paris. How does he get the bubbles to stay intact? Fascinating & beautiful, also playful, which makes it priceless! (The reflection of colors on the huge bubble make it gorgeous, too)! Makes me feel like I’m there-makes me smile!!!! Paris looks like a fun place to be, & it looks very clean! I love Paris. My daughter and I got the chance to go in 2010 for her senior trip. Spent 14 wonderful days exploring and want to go back again!